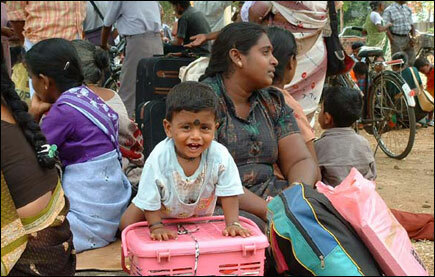 More than five hundred Tamil civilians bound for Jaffna district stranded in Vavuniya for the last eleven days Monday morning gathered in the Vavuniya district secretariat urging the civil authorities to take steps to send them to the peninsula. 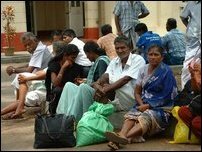 Vavuniya district secretariat officials said no concrete decision is taken regarding travel arrangement for stranded Jaffna bound civilians through A 9 highway. 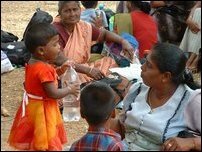 Meanwhile Sri Lanka Army officials said they would be allowing only 150 civilians who have registered them with the International Committee of Red Cross (ICRC) based in Killinochchi to enter army controlled Vavuniya through Omanthai check point. However SLA authorities were not in favour of allowing other civilians who have not registered with ICRC from LTTE held Wanni region into government controlled territory. In the meantime Vavuniya district secretariat officials said there was a move to allow another batch of stranded Wanni bound civilians Monday afternoon through Omanthai checkpoint, Vavuniy civilians sources said.